In the studio's [DreamWorks] quest to compete with Disney in the feature-length animation sweepstakes, it's a worthy entry. It's not as quirky as "Antz" or as grown up as "The Prince Of Egypt" but as silly fun it does nicely, and no wonder: Its directors are Disney veterans, and the soundtrack includes such effective cartoon voices as Kevin Kline, Kenneth Branagh, Armand Assante, Edward James Olmos and the unsinkable Rosie Perez. This is a ridiculous movie, made entirely of ridiculousness and it is one of my favourites. T'hb and I quote it frequently (‘you...made my life...an adventure...’) at each other. Also, might be keeping Tulio and Miguel (mighty and powerful gods!) in the list of prospective cat names. I really liked this movie, because I grew up watching re-airings of the Bing Crosby/Bob Hope "Road to..." [Morocco, Zanzibar, Utopia, Rio, etc] movies on Turner Classic Movies with my grandpa. It nails that late '40s cheeky screwball dialogue. I took my son to it in the theater and remember it being reasonably diverting, although basically a remake of The Man Who Would be King. 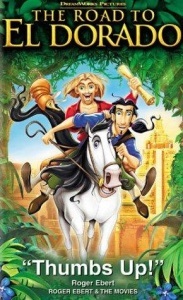 I have no idea why but this film and the Emporer'ss New Groove are firmly squished together in my head as one movie. So much so that I scanned the tags and wondered where Eartha Kitt's name was and then had to go look at her entire career on IMDB before realising that this and the Emperors New Groove are in fact not the same movie. I think I liked it, but Kevin Klein and K Barangh have such distinct voices that it's distracting to watch animated versions of them.